Rebuilding mask for dry and damaged hair, based on an innovative formula, using strengthening effect of bamboo extract and nourishing properties of plant oils. Highly efficient Hair Booster Complex precisely and thoroughly regenerates damaged hair structure and fills hair cracks. Creamy texture of the mask wraps every hair fibre, intensely moisturizing and nourishing it. The effect of smoothing is immediate; the appearance of hair is clearly improved. Care guideline: in the case of very dry and excessively fluffy hair, after massaging the mask, put on head foil cap and wrap it with a warm towel. The heat provides better and faster absorption of the active ingredients, contained in the mask. Leave the mask on hair for 10-15 minutes and then rinse with warm water. Apply a small amount of mask onto washed and towel dried hair from root to the end. Leave for 2 – 3 minutes and subsequently rinse thoroughly with warm water. Apply once or twice a week. 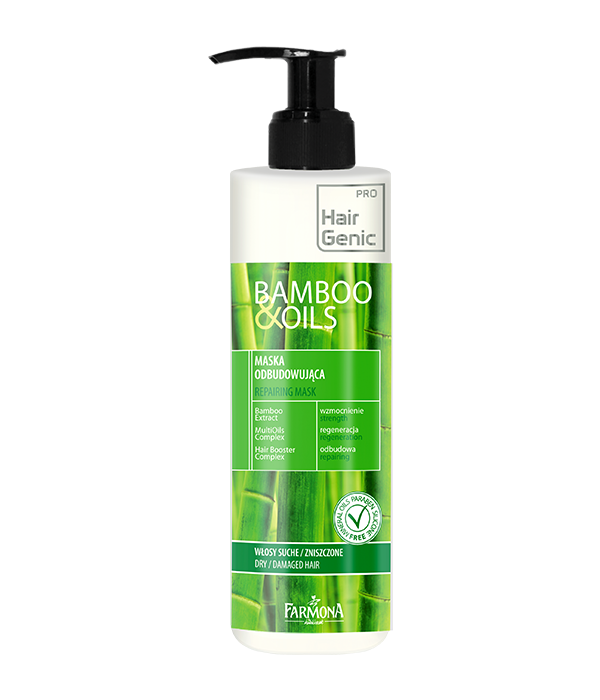 Bamboo Extract, MultiOils Complex, Hair Booster Complex, Orange Extract.